Destiny of an Emperor, a well-played and well-loved game, contains a number of secrets which fans have discovered over the years. 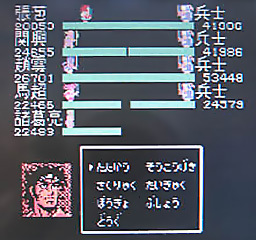 This particular secret is unique to the Japanese version of the game, and details how to encounter ‘Super Rebels’—rebels of unusual power found in an unusual place. Victory over these ‘Super Rebels’ leads to huge gains in experience. Hat tip: Darklancer, who submitted this tip, and some Nokia phone screenshots, to us. In the Japanese version of Destiny of an Emperor (not the English, this issue was ‘fixed’ in the game translation) there is a secret spot where super-powerful Rebel Forces can appear. These rebels have anywhere from 25,000 to 50,000 (or more) soldiers in their unit, are extremely strong, and perhaps most importantly, provide you with a mountain of experience should you emerge victorious against them. This spot is the ideal location for power-leveling to level 50. Use the two maps below to locate the super rebels. They can be found early in the Ba-Shu region (Liu Zhang’s territory). 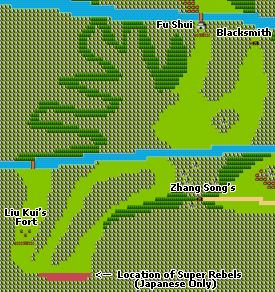 The location of the map where you can find them is west of Zhang Song’s hut and just before Liu Kui’s fortress. To fight them, travel southeast from Liu Kui’s gate, and walk along either of the two bottom-most paths until you fight. It is advised to save first, of course. They will make the fight you completed with Lu Bu earlier seem like child’s play. You do not encounter officers here—only the most horrifying rebel forces you will ever encounter. A zoomed-out view of Southwestern Ba-Shu. Super Rebels can be encountered on the spaces tinted red. A close-up view if the Super Rebel’s location. The spaces where they can be encountered are tinted red. Screenshot of ‘Super Rebels’, taken by ‘Darklancer’, who submitted this secret. This photo was taken with a regular camera from a Nokia phone with an emulator. Before we get into the finer details of how to fight the super rebels, it would be nice to share some screenshots of just what you are up against. 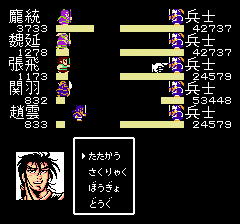 As you can see, they have more than enough soldiers (in many cases, well more than the final boss of the game), but an examination of their status shows that they generally lack the strength to back up their power. The ‘Super Rebel Forces’ aren’t very strong, but they have a pittance of intelligence. The ‘Super Brigand Forces’ are, for no good reason at all, very weak, but not very stupid. This makes them much easier to face than the ‘Super Rebels’. This is a smaller detachment of Super Rebels. They come in much larger groups. As you can see, generally speaking, they lack the stats to backup up their troops. Large detachment of Super Brigands. Their troop ranges are similar to the Rebels. As strange as it may seem, these Brigands are, apparently, overgrown kittens. Defeating the ‘Super Rebels’ will not be hard for you if you are high enough in level that you have access to tactics like An Sha or Ji Mian (all you would need to do is go all-out), so we will focus on the possibility that you are facing them at one of the lowest possible levels for this area. If this is the case, your party status will probably look something like the screen below. Ready to take on the ‘Super Rebels’? As you can see in my game, I’m quite low-level for this area. The ‘super rebels’ will be easy to defeat, however, with the right tactics. Now, we’ll pick a fight with a large group of ‘Super Rebels’. Why Rebels? Because they are much meaner than the Brigands. Why a large group? So we can show you that, even at this low level, you can effectively defeat the most powerful groups of these enemies. If you can win one battle, you will then have enough strength to continue fighting all the way up to level 50 without even returning to an inn. This looks like a rough group! Here’s a strong group of rebels that should serve our purposes nicely. Notice how the life bar of the 53,448-soldier rebel doesn’t stretch across the screen? The game doesn’t know what to do with so many soldiers in the yellow life bars. 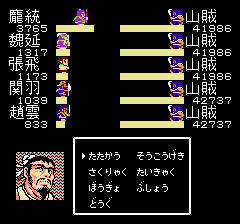 As you fight these rebels their life bars will deplenish a number of times over before finally fading away as the unit is defeated. After your first fight, this will correct itself. 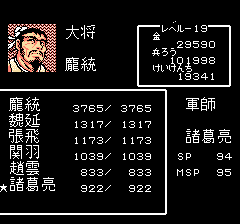 1) Use your weakest character to cast Ji Rou (first screenshot). This is important..
2) Have every other character cast Bei Ji on themselves (second screenshot). 3) As we are facing five rebels, we will want to remove two with physical attacks. Have all of your officers target a single low-troop-count Rebel Force. 4) As one is defeated, start focusing your attacks on your second target of choice. 5) With two defeated, we can now go all-out to defeat the remaining Rebels. 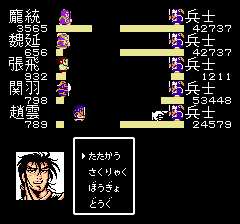 You should, basically, be able to complete the battle from this point easily. 6) If you do need to heal, press ‘B’ to cancel, and cast Yin Xian on your party. And oh, the rewards are sweet! 7) After your victory, you will gain an insane amount of gold and experience. In this case, we gained 157,221 experience! This provided us with 15 level-ups! 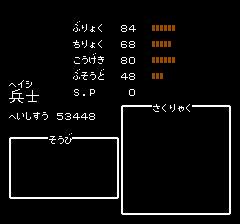 Reaching level 50, this game’s highest regular level, requires ‘only’ 817,116! 8) With the power gained from this single battle, level 50 should be child’s play. The Destiny of an Emperor overworld map is divided into a grid, and each section of the grid is populated by a certain predetermined set of enemies. When these grids overlap this results in meeting enemies from earlier or later in the game. There are other areas in Destiny of an Emperor where you can fight unusual enemies. A part of Ba-Shu east of Luo contains Jingzhou enemies, and a part of Wu east of Po Yang or Jin Du allows you the genuine displeasure of fighting Wei officers. This glitch was fixed by re-allocating the type of enemies south of Ba-Shu (which wasn’t difficult, as that block of the map didn’t belong to any other area). Where else has this happened? 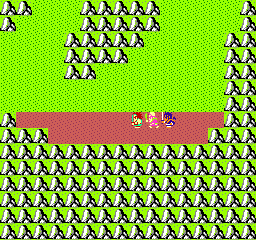 Hard-core Final Fantasy fans might remember fighting green jinn and giant red millipedes north of the port city found so early in the game.